The original Bruce Anchor has not been produced for the small boat market since 2007. The Bruce Anchor Group has returned to its roots of producing only large scale commercial mooring systems. After Bruce left the small anchor market, a number of other manufacturers have come forward to fill the void with the Lewmar Company probably being the most well-known of the current manufacturers of the claw style anchor. Originally designed in the early 1970s by Peter Bruce, the design was based on his other large-scale commercial anchors for fixed installations such as oil rigs and drilling platforms. The original Bruce Anchor and its copies have garnered a large following among boaters. As for sizing, currently Lewmar is producing the claw anchor in weights up to 176 pounds (80 kg.) An anchor roller platform is almost a must have item to conveniently stow and have the anchor available for immediate use. In this case there is only one major player available now that the Bruce Anchor Group has gotten out of the market. The Lewmar Company headquartered in the United Kingdom with offices in Europe and the United States is now probably the premier maker of the claw anchor. You can compare sizes and pricing here: Lewmar Claw Anchors @ Amazon or Lewmar Claw Anchors @ West Marine . Setting aside any shortcomings of the anchor design itself, the Lewmar name generally equates to a quality product. "Moreover, the claw does not set particularly well in harder seabeds if the anchor lands upside-down." Alrightyyyyyyy then, moving on . . .! 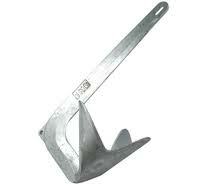 The Lewmar Claw is available in galvanized or stainless steel, in sizes from 2.2 pounds (1 kg) to 176 pounds (80 kg.) The Claw manufacturer’s specifications and sizing chart can viewed or downloaded here. Even though it is no longer in production we have the original Bruce Anchor manufacturer’s specifications and sizing chart. You can view or download it here.